The final day before the awards began with a guest lecture from Nancy Kress, winner of four Nebula Awards and two Hugo Awards. She shared some of her insights about writing scenes, writing with multiple levels, and the importance to worldbuilding of considering the economics and power structure of a society. She also shared the three most common mistakes she sees in student stories. She was followed by Doug Beason, a Ph.D. physicist and retired Air Force colonel who has written several novels. He talked about where to find information about recent scientific developments and how to develop science fiction ideas. Nina Kiriki Hoffman, who was a winner in the first year of the Writers of the Future Contest and went on to publish over a hundred short stories and many novels, explained how to sign books and how to use journals of your life as a resource for stories. She then gave all the winners a copy of her story-generating tool, Stone Story Soup: A Story Cookbook, and a twenty-sided die. The winners then spent twenty minutes writing about their randomly generated characters. 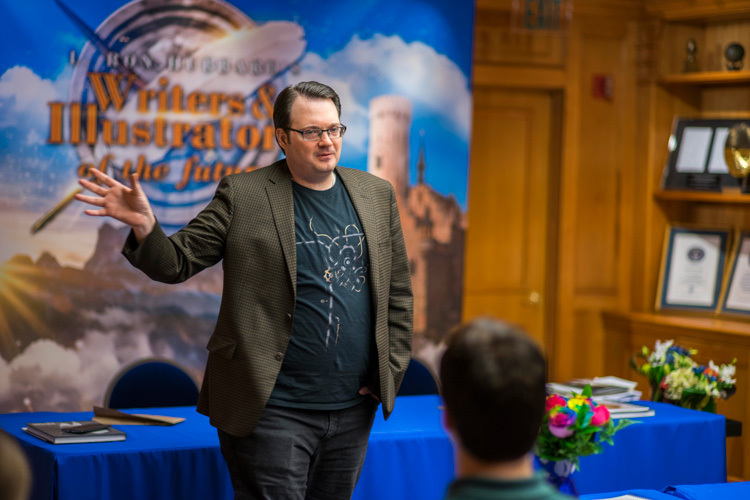 Bill Fawcett, a book packager and writer who has worked with New York publishers for decades, took the winners through a detailed examination of all the steps a book goes through from manuscript submission until the published version hits the shelves. Robert J. Sawyer, winner of both the Hugo and Nebula Awards, plus many others, talked about some of the problems in the publishing industry today, many of which are the result of Amazon’s dominance in selling books. He then encouraged the winners to write ambitious, powerful, moving, and distinctive books, rather than just trying to follow the trends of popular fiction. Liza Trombi, editor-in-chief of Locus Magazine, explained the importance of having a good agent. Gregory Benford, two-time winner of the Nebula Award, talked about being an astrophysicist first and then becoming a writer and how that helped give him a rich variety of resources to bring to his fiction writing. 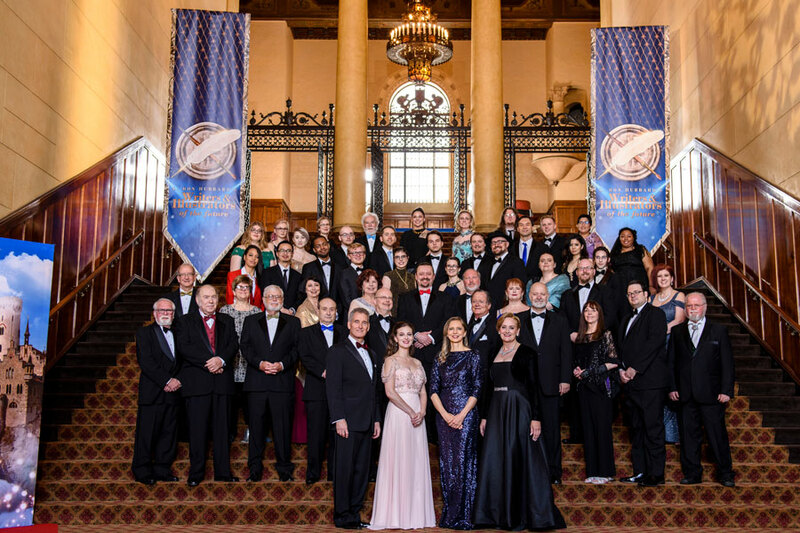 Larry Niven, a recipient of the Damon Knight Memorial Grand Master Award, as well as a Hugo and Nebula Award winner, gave advice about collaboration, the criteria to pick the right partner and the rules to follow. Namely, one of the writers has to have the power to veto. In a collaboration, the two writers can’t have equal rights. Second is picking a partner who is not a faster or slower writer. He then told some personal and affectionate stories about working with Jerry Pournelle. At the end, three former winners, Eric James Stone (Vol. 21), Kary English (Vol. 31), and Sean Hazlett (Vol. 33), spent an hour answering questions from this year’s winners, sharing things they had learned since winning the contest. We reviewed everyone’s finished assignments, an illustration for the short story “The Death Flyer” by L. Ron Hubbard. We were all amazed at so many wonderful and varied scenes drawn from the story. Next was a special guest speaker, animator Jeff Snow from Disney Studios who is known for his animation work on Zootopia, Batman, Spider-Man, The Simpsons, Tarzan; and over with Dreamworks—Shrek. Jeff Snow shared his knowledge of visual thinking, intuitive editing, and developing storyboards. With humor and wit, he got all of us laughing about his experience advancing in the field of storyboarding. Maryse Alexander, the Creative Director of Author Services then followed with a seminar on Color covering the use of color harmony and color depth in art. The Illustrator winners really look forward to receiving a review and critique from our Illustrator Judges—Larry Elmore, myself (Val), Echo and Lazarus Chernik. We sat around our “U” shaped tables with an extra seat on either side of us. The winners then sat on each side of us and received a 10-minute review of their portfolio, then in pairs rotated to the next judge. And oh, what wonderful work and stories they tell with their illustrations. Can’t wait for you to see them in the new anthology, Writers of the Future Volume 34. Echo, Lazarus, and I would like to thank our returning winners Bea Jackson and Dustin Panzino for helping with the portfolio reviews.